I have been hard at work on a new wool snapshots rug. This one is another panoramic but a little longer and wider than Joy Ride. I felt that I had to go with this bigger size because the children in the photo are quite small and I would loose all detail if I hooked a smaller piece. This rug is based on a family photo taken in Galveston at the pier at Christmastime. I loved the photo immediately because it showed the pleasure of a carefree moment of childhood. For me, the rug is bittersweet because the moment captured also depicts the last of childhood for these three cousins who were on the brink of young adulthood, when such moments of childhood freedom would become part of their past. Footloose and Fancy Free. 2018. 18" x 33". Designed, dyed, and hooked by April D. DeConick. Jean Boeckeler sent me photos of her finished 7" by 7" pieces. She started both of them in the Green Mountain Rug Camp. One is Max, her husband's devoted cat. What I love about this piece is Jean's choice of contrast and color with the purple blanket. The photo showed a cream blanket that didn't do much for the image. But wow the purple gives the whole mat a feeling of happiness. 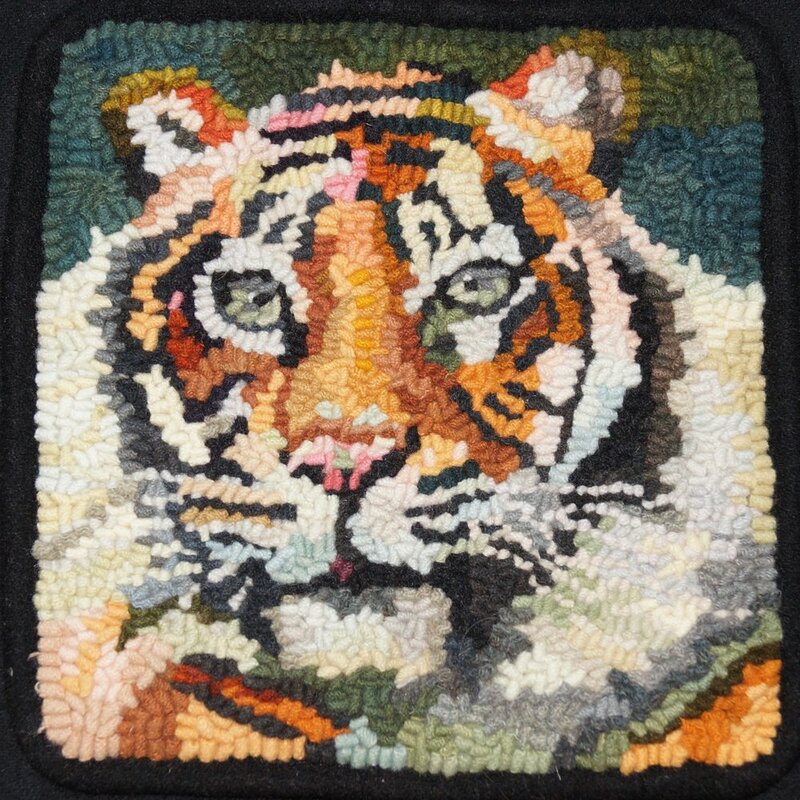 Note too the great plaid background hooked linearly and the whiskers embroidered on top of the hooking. The other is her daughter as a bride at her wedding in 2013. Jean remembers how lovely her daughter looked with gorgeous flowers and a pearl headband that she grabbed at the last minute. Jean embellished the hair with simple pearl beads in memory of that moment. I just finished a 10" x 20" panoramic snapshot rug of my sister and I riding bikes last summer on Mackinac Island. Wade snapped this photo of us with a long lens so that the photo would be candid. This picture is extra special to me because I had undergone surgery about six weeks prior, and the recovery was tough. So to be able to get on that bike and ride around the island felt like a miracle. All the more so because I shared that ride with my sister, but also my husband, son, and niece. Joy Ride, 2018. 10" x 20", #6-cut wool on linen. Designed, dyed, and hooked by April. D. DeConick. Original Photo 2017. Wade Greiner. I am continuing on the Mackinac Island series with a third 5" by 7" mat called Red Geranium. Anyone who has been to the island is awestruck by the profuse blooming red geraniums, how they grace window boxes everywhere and march in white troughs along the porch of the Grand Hotel. I figured that any series on Mackinac Island has to include this delight. Red Geranium, Mackinac Island Series, 2018, 5" x 7", designed and hooked by April D. DeConick, linen foundation with hand-dyed scrap wool. I still have halfway to go around the border of my bench cover with the Bighorn sheep. Tired of hooking rectangles! So I pulled out a series of wool snapshot mats that I wanted to do for some time and got started. This is a series of 5" x 7" photos taken on our summer trips to Mackinac Island. I don't know how many will finish the series, but here are the two I did this weekend. Back a couple of years, I taught my wool snapshots workshop at Sauder Village, and, since it was only a day-long course, most students did not finish there work on site. Terryl Ostmo got busy with life but recently returned to her project and finished it. She sent me this picture, which shows how adorable these miniature pieces are. Just wonderful how she captured the delight of her son Karl on his third birthday. I started this project last summer after returning from Rome. It consists of three 10" x 10" hooked canvases framed in a triptych series. Went back to it in August and finally finished them in white wooden boxes. The idea was to create a panel of wool snapshot memories of our adventures in Rome. Alex, Wade and I each selected photos of ourselves and various artifacts we especially loved. Then I hooked them into this series using my scrap materials. My canvas contains a photo taken of me at the Dionysus House of Mysteries at Pompeii. A clay sculpture of Demeter and a marble of Athena. Wade's canvas contains David, Venus, and Galileo. Wade's photo is one of him sporting a hat he bought in a Roman bazaar. Alexander's canvas has the famous mosaic of Alexander the Great and an ivory mask of Apollo. Alexander is sporting a cap that he bought in Rome at a men's store, and wore almost every day on our trip. I am really impressed. Here are more student rugs coming in from my Wool Snapshots class at Sauder Village. Keep in mind that these are all really small, only 7" by 7". Most used #6 cuts with some #4 thrown in. Martha Rosenfeld created her impression of Edie and Marianne in Hawaii. She used soft muted colors which bring out feelings of calm and joy, which must have been what they were feeling on vacation in Hawaii. The palm tree in the upper left corner was an an important element that Martha saved (rather than edited out) because it is a location signal. Jan Grose did a portrait of her mom in stunning vivid colors. The hot pinks and yellows bring liveliness to the face, and the cool blue background keeps it all grounded. There is no mistaking who this is! I will post more student rugs as they come in. 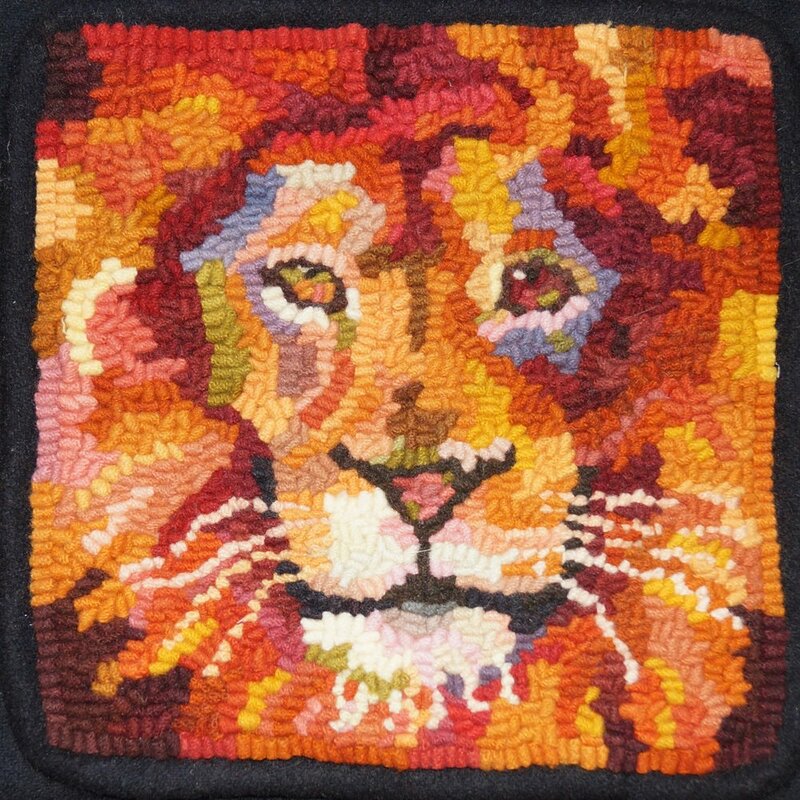 These are wonderful examples of wool snapshots. 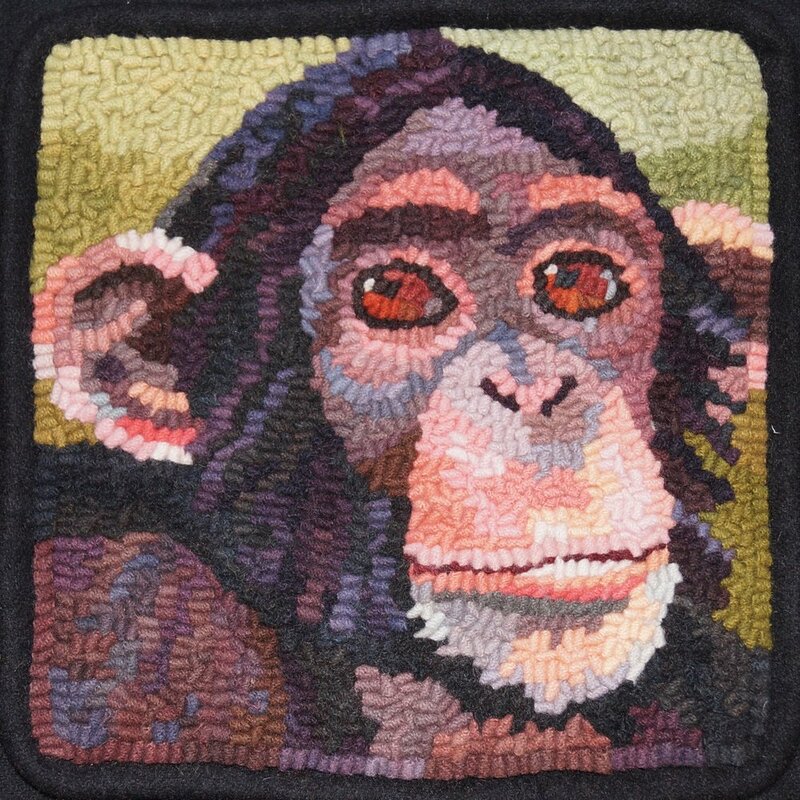 And these are the first attempts at creating these small portraits by these rug artists! Wait to see what they will do once they have a dozen of these snapshots under their belts. I know this is long overdue, but when I got home from Sauder Village, I was so far behind at home and at work that I have been playing catch up all week. So this morning I have a bit of a breather (although laundry awaits me) to share some impressions of my visit to Sauder this year. Here are pictures of me with my rugs and Alexander with his. My Wool Snapshots class was totally fun. Thanks to my sister Tiffany for helping out as my TA. All the women in the class were troopers and went home with pieces that were started and headed in good directions. I want to share with you Stacie Littlejohn's piece which she has just finished and sent to me. It is so wonderful capturing the impression of her little boy climbing his first tree (he is 38 now and her grandchildren climb the same tree). Other impressions. Well the Sauder Award went to the leaves that all of us hooked for the Wool Bomb. Mine was a rainbow leaf where I tried to used all the colors in the color wheel (top row in the center). Loved these pieces by Marilyn Becker and Kristen Brown and Martha Lowry. Marilyn's piece had intricate work on the lace dress that was stunning in real life, and the whole thing was created with wool that Marilyn dyed with natural dyes from nuts and berries. Kirsten's pig was so cute with all the wonderful color. Martha's primitive dog is lovely with soft muted color that gives the rug a feeling of quiet. All these are in the Celebration of hooked rugs this year. Really loved Susan Feller's movement toward fiber art and exploring straight lines in these barn doors. Liked these impressionistic leaves by Lori LaBerge. We just got back from a wonderful touring vacation, just driving around visiting family, friends and new places. Along the route, I had the privilege of meeting Deanne Fitzpatrick, visiting her inspiring studio, and teaching a group of talented rug hookers my process for creating stunning mats from snapshots. If you are interested yourself, I have written about this in a step-by-step instructional book available through LuLu self-publishing (refer to the left sidebar of this blog). 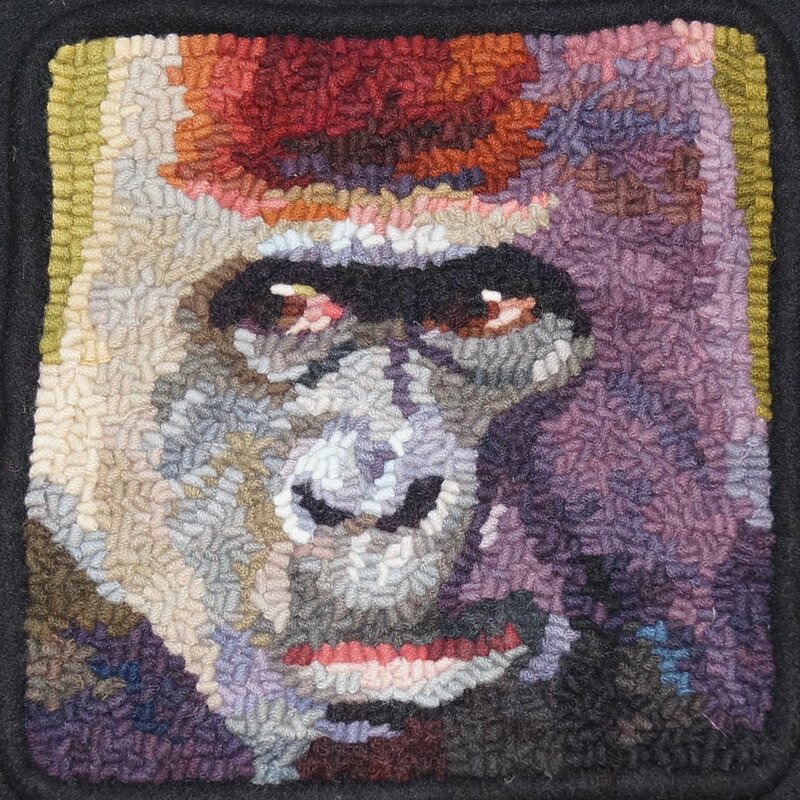 Wool Snapshot hooked by Susan Tirone, 2013. One of my students already finished her mat and sent me pictures of the final product to share with you. Very impressive indeed! Susan Tirone hooked this mat from a photo of her son and his friend. It measures only 7" by 7" and was done with #6 cut wool scraps. Photos are used with written permission of Susan Tirone. I have been slowly working on another snapshot portrait this week. There is an old photo of my mom that holds many memories for me. So even though the exposure from the film camera wasn't the best, I dug it out of the family album. I scanned it into the computer and got to work. I did not edit the snapshot very much (I usually do) because the essence of this photo is where my mom is. Her favorite place. Glacier National Park. She was drawn to the natural beauty of the mountains. Here she is awed by the sparkling light on the lake and the freedom that the mountain landscape offers to all those who attend to it. As I hooked the piece, I was taken back to my childhood, to living on a farm, vacationing in a camper, and enjoying being together with my family. I miss you Mom. I have been working on writing and illustrating a book on how to make snapshot portraits. It turned out really well. I wrote it as a step-by-step instructional book. It is 68 pages, full color, 59 photos and illustrations. It is professionally bound and available at LuLu.com. See the left side bar for the direct link for ordering it if you are interested. The third step is to use a permanent ink marker to draw your lines onto your foundation. If you are doing a gallery canvas frame technique keep in mind that the edges of the foundation will not be bound but will show. So first draw a 7" by 7" square in the center of a 20" by 20" finished edge foundation piece. Use a pencil to do this! And do not draw anything outside this line. Next attach your transfer fabric and center your motif as you want it inside the pencil square. Use ink marker to make the transfer. The second step in creating a Snapshot Portrait is to select a photo and get it transferred to your foundation. I use digital photos, which I crop with a square in my photo program. I play with the photo on my iPad using different photo filters until I have something I like. Also make sure to save a black and white version of the photo as well as a color photo. These need to be enlarged to 7" by 7" square. I use a program called PhotoRazor to do this. It is a free download on the web. Just run a google search and it will turn up. Print 2 copies of the black and white version and 1 copy of the color in the 7" by 7" square. Lay your transfer fabric over one of the black and white copies of your photo and draw around the light and dark areas, outlining your subject. Reduce what you choose to draw. The fewer elements the better. These are small!